WASHINGTON — OneWeb founder Greg Wyler says a self-funded side project of his has developed an antenna module costing $15, paving the way for user terminals priced between $200 and $300. OneWeb’s first six satellites launch Feb. 19 from French Guiana on an Arianespace-operated Soyuz. For large constellations such as OneWeb’s system of 600 to 900 satellites to succeed, high-tech antennas that can track multiple satellites at once are viewed as all but essential. “They are vital,” Dimitris Mavrakis, an ABI Research analyst covering antennas, told SpaceNews by email. Constellations in low and medium Earth orbits, unlike geostationary satellites, move across the sky. Keeping in contact with such satellites requires ground terminals capable of tracking the satellites, either by mechanically repositioning a dish or using a stationary antenna that uses so-called electronic steering, or scanning, to maintain the connection. Wyler said a team of just over 20 people at Wafer have been working on the electronically scanned antenna arrays that would work with OneWeb satellites and other constellations. He said it is still to be determined if Wafer will build the entire user terminal, or just the antenna module. OneWeb investor Qualcomm is building modems for OneWeb user terminals. Wyler described the antenna as the “critical and hardest subcomponent” of the terminal. Satellite operators have bemoaned the slow pace of antenna technology development. Mavrakis said the high part count for electronically scanned antennas has made cost reduction difficult. Even with breakthroughs using metamaterials, like the approach of Redmond, Washington-based Kymeta, progress has been slow, he said. 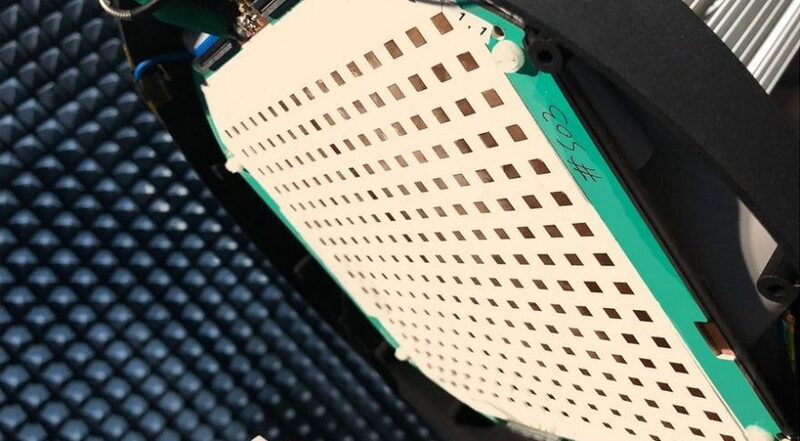 If Wafer’s antennas are productized as full terminals by 2020 as envisioned, they would enter the market the same year OneWeb expects to activate its satellite broadband service. OneWeb anticipates starting a rapid launch campaign in the second half of 2019, with Soyuz launches every three weeks carrying more than 30 satellites each. In a previous interview, Wyler said OneWeb anticipates having 150 satellites in orbit by the end of 2019. The company is targeting 300 satellites in orbit before starting service. OneWeb is seeking to raise additional funds while the cost of its satellites has grown past their $500,000 target. A Jan. 21 Financial Times article said it will cost OneWeb more than $1 million to build a satellite — more than twice the goal stated at the beginning of the program. Airbus Defence and Space and OneWeb are building the constellation together through a joint venture called OneWeb Satellites. OneWeb originally estimated the cost of the complete satellite system at $3.5 billion, but no longer affirms that number. Better than expected satellite performance from ground testing led OneWeb to reduce its baseline constellation for global coverage from 900 to 600 satellites, lowering overall costs should OneWeb forgo the last 300 spacecraft. Wyler said by email that OneWeb has raised more than $2 billion, but less than $2.5 billion, to date, having chosen to not publicly disclose every funding round. Previous publicly disclosed funding had put OneWeb’s total capital raised at $1.7 billion, with the majority coming from Softbank. Early results suggest the Wafer prototype could provide downlink speeds of 50 megabits per second, Wyler said. That’s twice the rate the U.S. Federal Communications Commission considers acceptable for fixed broadband connections. Combining multiple antenna “tiles” would provide higher throughputs from a single terminal, he said.